Facebook recently announced it would delete a Russian firm’s accounts over alleged data scraping and take down a series of accounts that were said to be focused on entertainment but were instead tied to military personnel in Myanmar. The social media giant is “not as in control of its business as it needs to be,” said Brian Wieser, an analyst at Pivotal Research Group. Facebook has been busy dealing with security issues over the past week, taking down the Russian firm SocialDataHub’s accounts over alleged data scraping, as well as a series of accounts that were said to be focused on entertainment but were instead tied to military personnel in Myanmar. All these may suggest the social media giant is “not as in control of its business as it needs to be,” Brian Wieser, an analyst at Pivotal Research Group, said in a note sent out to clients on Wednesday. Facebook’s stock has been under pressure since July 25, when the social-media giant posted quarterly revenues that fell short of Wall Street estimates and warned investors that top-line growth rates will decline by “high single digit” percentages in the coming quarters. Shares fell more than 20% immediately after the earnings report, and are 27% down from the high set on July 25. 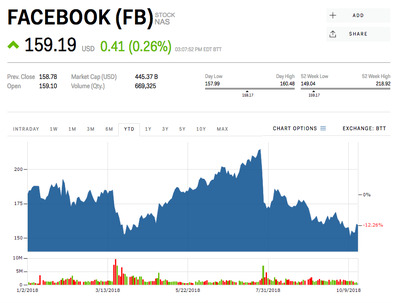 Wieser, a long time Facebook bear, who has a “sell” rating and $US131 price target – 18% below where shares are currently trading – laid out three major risks that investors should consider when buying the stock. “Web publishing and related businesses are highly competitive, which is only partially mitigated through ongoing investment of billions of dollars in capital expenditures annually,” Wieser said. Wieser wrote: “The consequence of this competitive intensity is that ongoing – and potentially rising – investment levels are required. It occurs in both in a publisher’s facilities (for example, bringing data centres closer to consumers) and in consumer-facing activities (such as social networking and online video, which require significant spending on servers, storage and other networking gear) in order to secure a company’s core business.